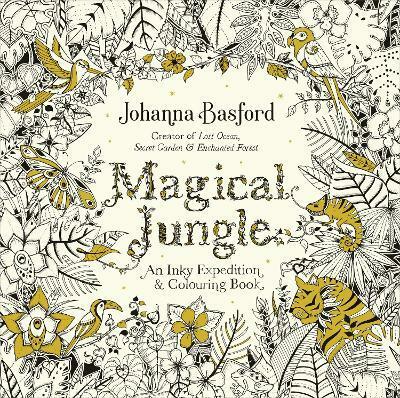 Follow ink evangelist and queen of adult colouring, Johanna Basford down an inky trail through Magical Jungle and discover a forgotten world of flora and fauna just waiting to be coloured in. Through intricate pen and ink illustrations, colour-inners of all ages are invited to explore an exotic rainforest teeming with creatures large and small. Encounter speckled tree frogs and dainty hummingbirds, prowling tigers and playful monkeys. Let your imagination run wild in the leafy treetop canopy or find yourself drawn to the delicate world of sensational blossoms and tropical plants below. There are ancient relics to be found along the way, each one leading toward the mystical treasure hidden at the heart of the magical jungle. Only the bravest, most inquisitive colourers will discover what lies hidden at the end of this inky quest.